On 16 Jul 2018 The RLC Foundation organised Ex LOG SAFARI which is a showcase of RLC trades and skills at RHQ The RLC at Deepcut. The exercise, organised by Capt Hattie Bennett and the SO3 Officers from the Corps Recruiting Liaison Office, showcased the skills of officers and soldiers from 621 Sqn 11 EOD Regt, 47 Sqn and 63 Sqn 13 AAS Regt, 59 Sqn 29 Regt and RLC Chefs from 26 Engr Regt. 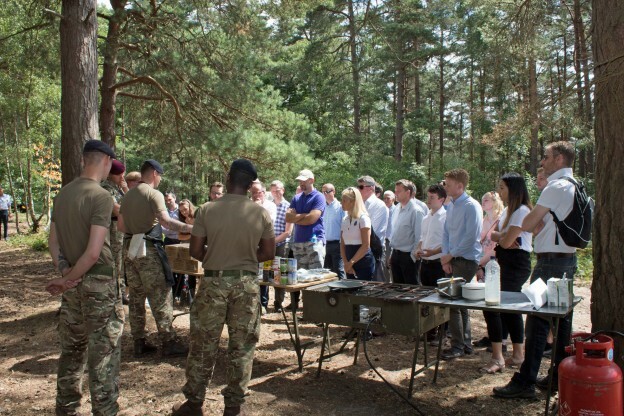 Visitors had the opportunity to learn about the equipment that is used to cater for large numbers of troops in the field and watched Sgt Thompson’s team preparing lunch in their 40-man field kitchen. At 11 EOD Regt’s bomb disposal stand, guests had the opportunity to trying on a Mk6 Bomb suit weighing 35Kg. Captain Todd and his team from 47 (Air Dispatch) Sqn explained the training they must go through to enable them to drop supplies and equipment to our forces located anywhere in the world. The Fuel and General Transport Troop from 63 Sqn 13 AASR demonstrated the range of vehicles it uses to re-supply the British Army’s air assault brigade in the field. Visitors also had the opportunity to learn about movement control from 29 Regt and the capabilities of RLC’s Postal and Courier operators. Feedback from the corporate and military community who attended Ex LOG SAFARI was extremely positive. The Foundation would like to thank Capt Bennett and the participating RLC Regiments for making it possible.